Ediriweera, M., Howell, L., & White, C. (2014).‘Say Again?’ An in-house, online, self-access pronunciation project for ESOL students. Studies in Self-Access Learning Journal, 5(2), 143-152. This collaborative project comprises the creation of free online pronunciation activities which are geared specifically for independent learning, although classroom use is also valuable. These are particularly suitable for pre-degree English Language students at Waikato Pathways College, but could be useful to any English Language learner. With teacher input for content creation, the recordings were done on site and the activities re-recorded to reflect input from continual feedback from students and teachers. This project is a work-in-progress. This project started in response to requests from academic and general English language students for extra help with their pronunciation. 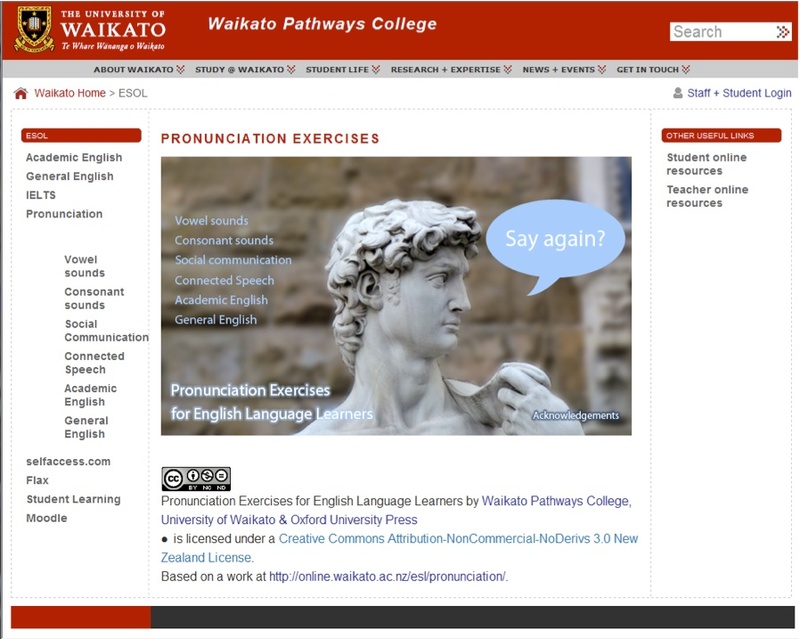 Waikato Pathways College (WPC) English Language Resource Centre (ELRC) staff sought to facilitate independent learning in the complex area of pronunciation by providing free online activities. These are easy to access via mobile devices which are optional and additional to classroom work on pronunciation, and as White & Gillard (2011) conclude, “Today’s students learn through interactive web chats, virtual game simulations, texting, podcasts, and other real time authentic activities. Digital learning has become a staple in modern society” (p. 5). In 2010 at The University of Waikato, a newly introduced screen-capture application, Panopto, seemed particularly suitable for the creation of online pronunciation activities designed especially for WPC students. 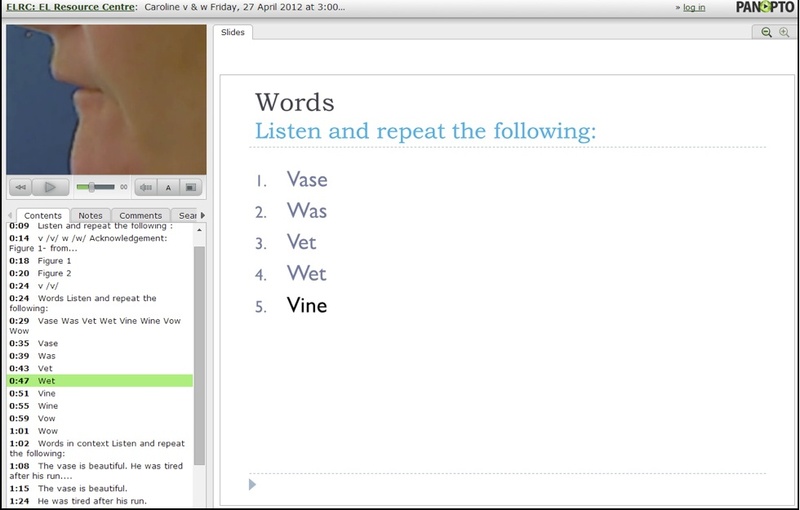 Students can work on the podcast and vodcast activities in their own time or with a tutor, in the ELRC in pairs or groups, or teachers may use the materials in class to reinforce or replace their own input on pronunciation. However, the­­se are essentially self-access, independently driven tasks. The pronunciation activities are suitable for English learners at any level, and the content topics are suitable for classes working at intermediate/advanced academic levels and those preparing for IELTS. 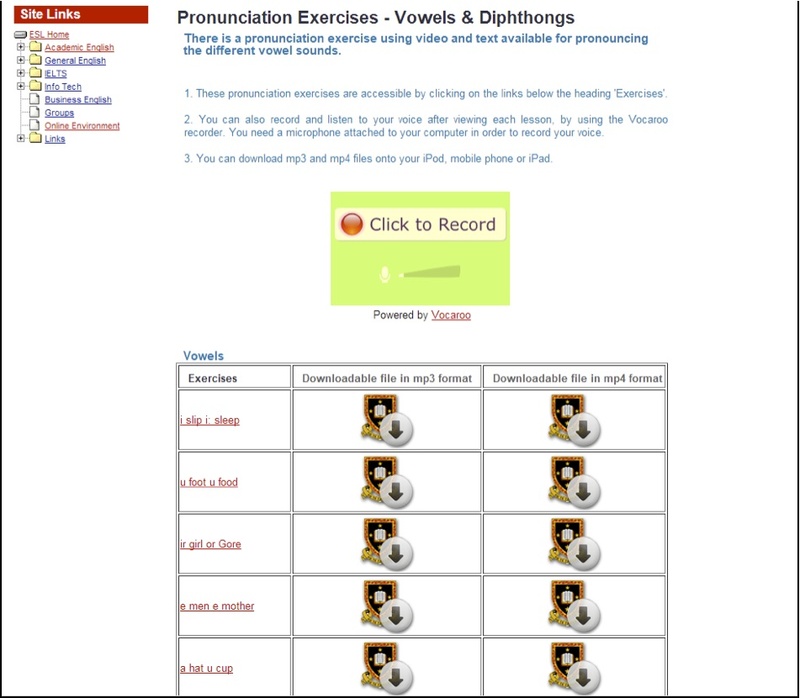 The landing page of the online pronunciation activities is shown in Figure 1. ‘Say again’ is a phrase used to seek repetition and avoid failure in marine communication (Strevens & Weeks, 1984). The same phrase is often used by teachers in English as an Additional Language (EAL) classrooms because of its transparency and immediacy, instead of the more communicatively appropriate “Pardon?” or the more direct, but longer “What did you say?” or “Could you repeat that?”. The authors believe this phrase lends the same transparency and immediacy to this project. As Ducate and Lomicka remind us, “pronunciation plays a significant role in comprehensibility” (2009, p. 66). As well as possibly causing communication failure, pronunciation can generate negative or positive value judgements about the speakers (Leather, 1999). Accent especially is a recognised source of humour and raises issues of identity (regional, national, ‘other’), prestige or stigma (Holmes, Stubbe, & Marra, 2003; Jenkins, 2007). However, pronunciation has traditionally been an area in which EAL teachers lack confidence. Teachers may also be confused by the emphasis in commercial materials on the perceived prestigious British English accent termed ‘Received Pronunciation’ (RP), when, as is the case in New Zealand (NZ), not all the RP vowel sounds coincide with their own oral production. The ELRC pronunciation project described in this paper was driven by an emphasis on teaching materials appropriate to the local context, using NZ teachers’ voices as models. The objective in designing activities was to help students achieve the communicative clarity they felt they lacked. The project’s agenda included intensive work on segmentals, because individual phonemes can be specifically targeted. Students from most language backgrounds are challenged by the stream of English speech when either listening or speaking, so features of connected speech are also targeted, especially intrusive w/j/r and catenation (linking) and strong/weak pronunciation of function words. The exposure to these aspects of pronunciation aspires to aid the students’ production of language and also have a positive impact on students’ listening acquisition as suggested by Hasan and Hoon (2013) “The results of the reviewed studies suggested that the application of podcasting enhanced students’ language skills in general, and listening skills in particular” (p. 132). Supra-segmentals (stress, rhythm, intonation) affect communication in terms of their effect on meaning, mood, and attitude. Hence the project includes a focus on word stress (to avoid errors such as impotent/important; greenhouse/green house), phrase stress (to clarify meaning, e.g. a blue car/a light blue car and clause stress (e.g. This is my sister Liz./This is my sister, Liz.). This project focuses on the need for speakers to improve their own perceived weaknesses. These gaps are identified through experiencing difficulties in communicating with others, and through testing at WPC. Pronunciation is included in the continuous speaking assessments at WPC, and our academic students receive written feedback on their performance indicating specific areas in which they need to improve. 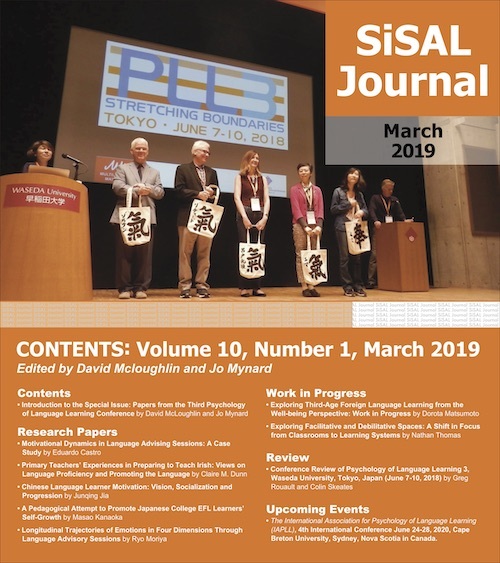 Additionally, the topic content of material in this on-going project either relates directly to students’ academic courses, so that they can perceive the relationship between private and classroom study, or it is contextualised for general/social survival in an English-speaking society. The academic content takes account of vocabulary frequency in Nation’s academic wordlist (2001) and Coxhead’s research contribution in that area (2000). The authorsproduced activities using localteachers’ voices with NZ accents, as there was very little NZ pronunciation practice material available commercially. Figure 2 shows the page with links to vowel sounds. As corroborated by Ducate and Lomicka (2009), “Technology, specifically the use of podcasts, could offer opportunities for contextualizing tasks, while at the same time honing pronunciation” (p. 68). 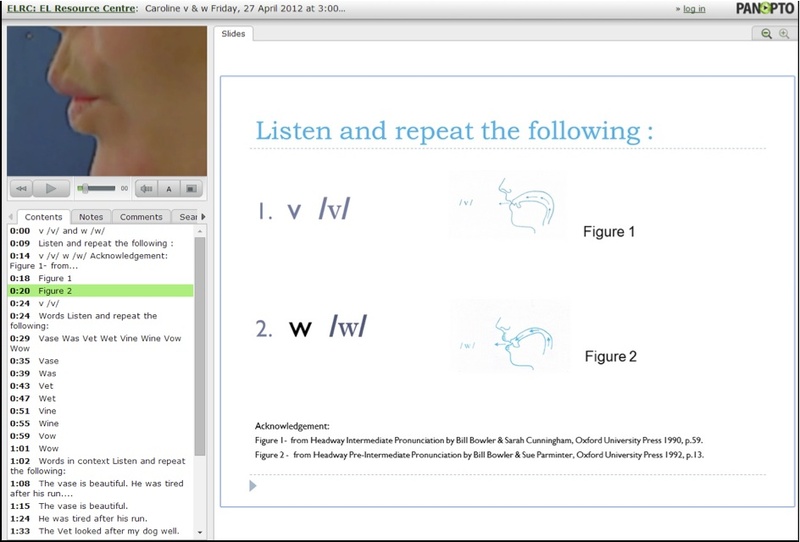 Panopto allows multiple inputs, including PowerPoint slides (for more details see http://online.waikato.ac.nz/esl/pronunciation). 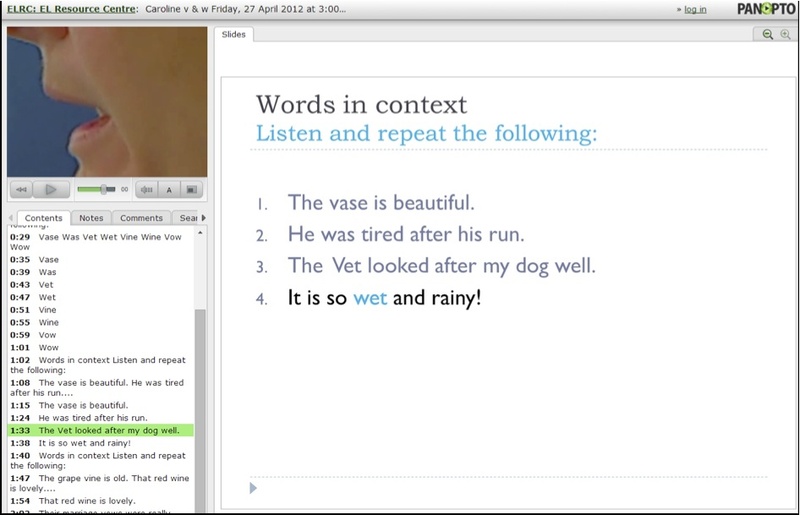 The online recorder allows students to record their own pronunciation of the activities which were audio and video recorded by teachers as pronunciation models. Each recording can be accessed via a separate url, podcastor vodcast downloaded onto a mobile device for eLearning and mLearning. Recordings are accessible 24 hours a day, 7 days a week, as an Open Educational Resource (OER), with a Creative Commons Licence applied to it. The need for the ready availability of resources which can be accessed on multiple platforms or mobile devices is supported by Levy (M. Levy, personal communication, August 31, 2012) who concluded at the Plenary Presentation at the Independent Learning Association Conference 2012, “The need is for learning material to be created for the various devices (phones, tablets and laptops), to be used anywhere, anytime” (Levy, 2012). Figure 3 shows that activities are downloadable and are accessible on iPads and smart phones, as well as on computers. These exercises are particularly useful as a warmer – not only do students get to practise their pronunciation, it is also fun and motivating which puts them in the right state of mind to commence class. Students can practise pronunciation by themselves which is very helpful as many students are quite anxious about their pronunciation. Some of the reasons for the positive perceptions included the opportunity for students to learn at their own time, and to listen to specific materials that they miss or do not understand multiple times (p. 133). This process of development and feedback is on-going, and inevitably constrained by limits of time. The opportunity to provide input to the project provides professional development for teachers in the area of pronunciation so that they gain confidence as they acquire expertise in producing material. To date, surveys conducted with teachers and students have elicited feedback which has been largely positive but has served to improve activities, for example, by providing diagrams of the mouth to show the articulation points of phonemes, and to develop new activities, such as integrating activities with the materials used in class. Also, activities have been revised and re-recorded to improve the quality, content and length of recordings by reducing input so that students repeat shorter models. There are now two types of tasks, phoneme practice, following the IPA chart, and vocabulary items (words and phrases) from class text content. Individual students can view and listen to and watch the speaker pronouncing words which exemplify the phonemes, or target lexical items, then record these and play them back to compare their own production. The students can compare their recording to that of the teacher, or, there is scope here for peer-assessment. When these pronunciation activities are run during class time, teachers can give feedback to individual students. It is hoped that in the future, that if all WPC students have access to ePortfolios, then they will have the ability to submit a podcast of their production for a teacher to assess and provide feedback. As for automatic, immediate feedback on student production, we are yet to find a free online waveform application which can be embedded, that would show the speech patterns for a more accurate comparison, when students are working independently. An example of a page showing the difference between two consonant sounds is shown in Figure 4. The page showing the individual words is shown on Figure 5. Figure 6 shows the words in context. This on-going project has provided WPC students the opportunity they requested to work on their pronunciation independently at any time of day or night. It has had the additional benefit of affording professional development in the area of pronunciation for WPC teachers and in the area of technology for ELRC staff. With more teachers and students using these activities, in class and as independent learning, and with the possible use of ePortfolios, it is hoped that this project will expand in order to create more resources suitable for the specific levels taught at Waikato Pathways College. Ducate, L., & Lomicka, L. (2009). Podcasting: An effective tool for honing language students’ pronunciation? Language, Learning & Technology, 13(3), 66-86. Retrieved from http://llt.msu.edu/vol13num3/ducatelomicka.pdf. Hasan M. M., & Hoon, T. B. (2013), Podcast applications in language learning: A review of recent studies. Canadian Center of Science and Education, 6(2), 128-135. Retrieved from http://www.ccsenet.org/journal/index.php/elt/article/viewFile/23820/15118. Holmes, J., Stubbe, M., & Marra, M. (2003). Language, humour and ethnic identity marking in New Zealand English. In C. Mair (Ed.) The politics of English as a world language: New horizons in postcolonial cultural studies, pp. 431-456. Amsterdam, The Netherlands: Rodopi. Jenkins, J. (2007). English as a lingua franca: Attitude and identity. Oxford, UK: OUP. Leather, J. (1999). Second language speech research: An introduction. Language Learning, 49(1), 1-56. Levy, M. (2012). The student’s voice in designing optimum CALL environments: Approaching questions of autonomy and independence in a networked world. Plenary Presentation at the 5th Independent Learning Association Conference 30 August – 2 September, 2012, Wellington, New Zealand. Nation, I.S.P. (2001). Learning vocabulary in another language. Cambridge, UK: Cambridge University Press. Strevens, P., & Weeks, F. (1984). Seaspeak reference manual. London, UK: Pergamon. White, E. L., & Gillard, S. (2011). Technology-based literacy instruction for English language learners. Journal of College Teaching and Learning, 8(6), 1-5.